We seem to be at an impasse in the climate crisis. Rich nations like Canada, having already used fossil fuels to create a prosperous lifestyle but polluted our atmosphere in the process, are making unfair demands at international climate talks. We ask that other, poorer nations commit to matching cuts, even though they had little hand in creating our current overload of atmospheric carbon. Compounding the unfairness is that we can afford to sit back and dither, growing rich and spewing more waste while poorer nations are already suffering catastrophic effects of sea rise, drought, and violent storms. Well, this Sunday, Canadians from all walks of life come together in Toronto to promote a different vision at the March for Jobs, Justice and the Climate; a new partnership between environmentalists and labour, providing voice for First Nations, migrant workers, youth, faith communities, and other stakeholders struggling for justice and a sustainable future. This event targets the myth that moving toward a sustainable environment will cost jobs. Quite the opposite: decarbonizing our economy is a huge economic opportunity. A better, stronger, fairer economy will create billions of jobs, but we must ensure those jobs include a fair wage and livable conditions, and that all will benefit from the prosperity of the green energy revolution. Climate justice means a more inclusive conversation. This year, over 300,000 people in the global south will die from violent, chaotic climate weather-related events. Yet Canada is well-placed to show leadership. Millions of our first-generation citizens have direct experience with climate chaos, such as the Filipino and Caribbean communities and people with ties to India. They link us directly to both the problems and the global solutions. 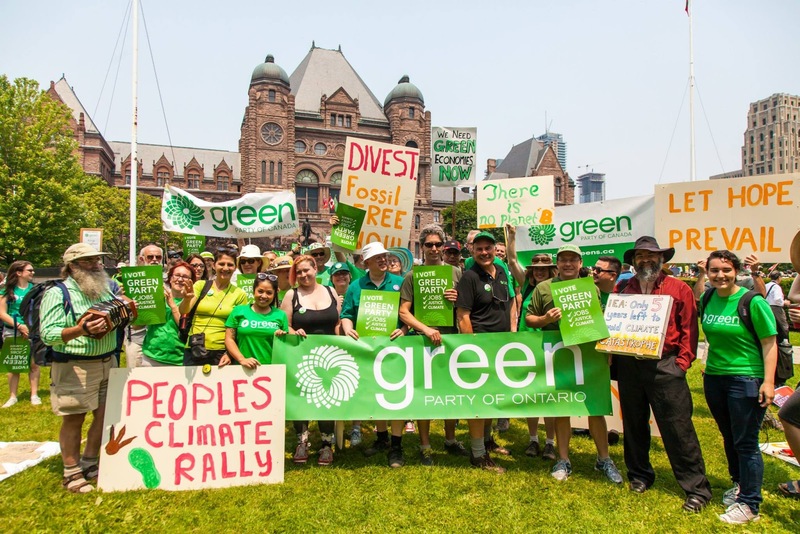 Many demonstrations are about the “NO”: against tar sands, pipelines, fracking, or new nukes, but this march is about the “YES”, about building a fair, just, sustainable economy for the whole planet. We have the solutions: clean energy, better transit, localized agriculture, fair labour standards; we just need to come together and apply them. For one specific idea, Barrie—Springwater—Oro-Medonte Green Party candidate Marty Lancaster proposes that Barrie become a hub for new research, technology and production of next-generation batteries and energy storage. The growing popularity of electric cars like my Chevy Volt, and the pairing of clean renewable energy with storage to create on-demand electric supply, means this is sure to be a growing and high-paying industry. (More on this in a future column). For a healthy, sustainable, just world for our children, our grandchildren, and their children, we must stop digging a deeper carbon hole and start building a stairway to an economy that provides for us without robbing future generations or disadvantaging other nations. This march is all about building that “stairway to heaven”, if you will. And Barrie will be there! You can join Marty Lancaster and local activists Climate Action Now at the Allandale GO station Sunday morning to catch the 9:40 train, arriving at Queen’s Park before the 1 PM rally and march to the Allan Gardens. Find more information and connect with Barrie’s contingent via Facebook.com/ClimateActionBarrie or if you are coming from elsewhere, visit JobsJusticeClimate.ca/Transportation to find charter buses or ride-shares. 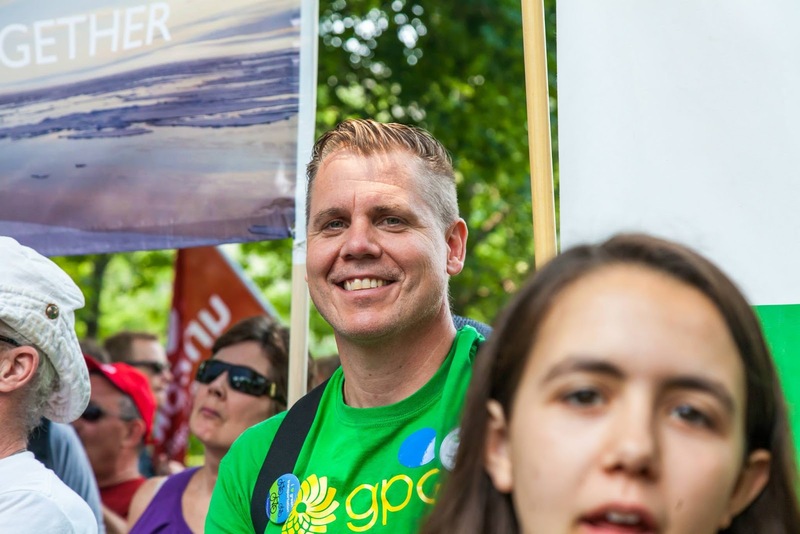 Let’s set Canada on a just, sustainable path of climate leadership and prosperity! A politically expurgated version of this was published as my Root Issues column in the Barrie Examiner.